It's Currently again! The delightful and charming Lindsey from Ot and Et is in charge whilst Randalin from Harvesting Kale is enjoying her time with her new baby girl. If you don't know the drill essentially you just use the given themes for the week or create your own and let everyone know what's Currently going on with you! I am trying hard to find something that will fit under the category liking, I tend to find myself in either the loving or the hating camp. I rarely just like. I am currently loving Wiggles' willingness to eat whatever she's given. She gies through hungry spells and less hungry spells. Right now she's an eating machine! Biscuit on the other hand is less into her food right now, driving us a little batty! I have been spending a lot of time thinking about summer holidays. It seems to be the time of year that people start booking breaks for the summer months. I'd love to go away somewhere warm and exciting, just the four of us. I have no idea where though! Hence the subject needs a lot of thought! Biscuit has been giving a lot of thought to her birthday and has been compiling a list of things she would like (it's not til April!) so I have been thinking ingenious ways to get her the things she would like! I can't think of a thing I've been planting! Snow drops are pretty much the only thing blooming round here! It's the middle of winter, the ground is still pretty hard. We seem to be in a sort of static limbo, waiting for stuff to happen. Although I watched an item on the news the other day that suggested that Spring flowers would probably bloom earlier this year, because it's been wet and mild rather than freezing cold. I am looking forward to seeing bulbs start to push their way through and brighten things up. I am pinning all my hopes on not making a fool of myself on the quiz show I've entered. I fly off to Scotland later today. Wish me luck chaps! So come on, if you haven't before, why not give it a go! Join in? P.S Have you entered my giveaway yet? Today is the last day! So why not?! Click the image below to be in with a chance of winning a crochet blanket, handmade just for you and a selection of fabulous crochet gifts, good luck! Monday - The first day of half term. Ahh the joys! I'd breakfasted, dressed and set my mini reprobates up with things to play by half last nine. We tidied up and sorted out, by which time it was time for lunch, the small people appeared to only be willing to eat grated cheese. Ugh. 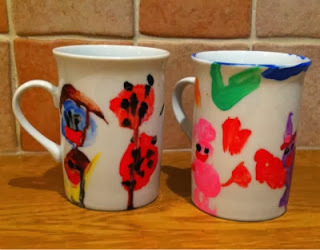 Wiggles had her nap and Biscuit decorated a pair of mugs she was given for Christmas. So cute!! One for her sister, one for herself! Ladybirds and smiley faces. My Mum and my brother returned from their weekend away and we popped to the supermarket. Tuesday - In the morning we went out for tea and cake over at Clock's house. I haven't known her for very long, we met at Wiggles' baby group. She is lovely and it was really nice to spend some time getting to know her a bit better. Plus I am never adverse to cake! Wiggles and Biscuit both behaved beautifully and I was dead pleased with them. In the afternoon Biscuit seemed to be feeling poorly again, so we didn't really do a great deal, just let her rest and snuggle on the sofa. After Mr Husband and I put the small people to bed I whipped out for a quick trip to the supermarket as I knew they had a sale on their clothing range. I mostly needed to buy tights and scored some brilliant ones in the sale - good job! Wednesday - work for me, lovely to spend the day with LB. She really is great to work with. I had finished the blanket I'd been making for Carlos the Jackal - she's been off work lately for personal reasons - and we decided that we wanted to send her something to (hopefully) cheer her up a bit. LB was so sweet about it, I was dead chuffed. I'd tried really hard to match the colours to the colours Carlos has in her sitting room. Mr Husband was tensely watching the football in the evening so I retired early to bed to do a little swatting up on quiz questions and also to watch The Great British Sewing Bee, which I really enjoy. Thursday - Wiggles had woken up in the worst mood. 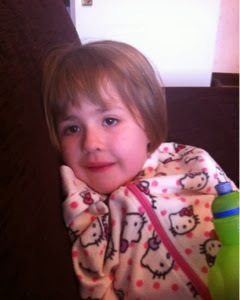 Even before breakfast she'd bitten her big sister and chucked a toy microphone at her head! We had a message from our friend L to say that she would be at the Sing Along session at our local library in the morning and would be going for a cuppa after that if anyone fancied joining her. I thought it would be a nice thing to do with the girl's although I worried that Biscuit might feel she was too old. Shameless outfit selfie before leaving? Ok! 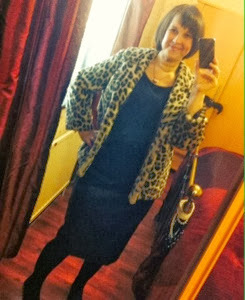 I was lucky enough to be given this fabulous coat by my wonderful neighbour and friend Auntie Ro. Great, ain't it? Both girls enjoyed themselves and it did seem to distract Wiggles from being a devil, for a little while at least. She did produce a hideously stinky nappy as soon as we arrived, which I'm sure she did on purpose! We went for tea afterwards and cake and it was nice to catch up. L is lovely and her girls are so sweet. We came home and Wiggles and Biscuit both helped me make lunch, they seem to be quite into chopping at the moment, so Wiggles armed with a safety knife produced her lunch and Biscuit proudly chopped with a grown up knife. She was very careful and did so well. After lunch I put Wiggles down for a nap, although she mostly refused to submit! 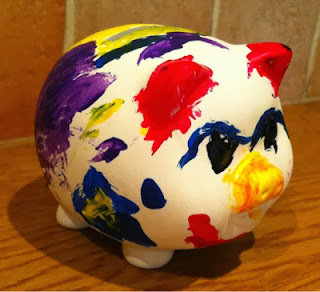 Biscuit painted a piggy bank she'd had since Christmas as she was feeling crafty. Because it had rained for most of the day we decided to go for a walk when we spotted some sunshine. I love walking with both girls and the woofer. In the evening Mr Husband and I caught up on some of the TV we'd been storing up on our Sky box. Friday - Work for me, it was Tallulah's Birthday so I met her at lunchtime to give her presents. She was off to spend the afternoon with her family. 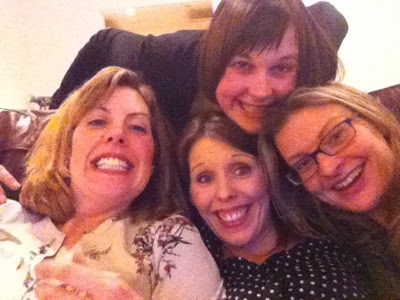 I wish I could have joined them, her family are ace. I grabbed an M&S lunch and bought some milk. Nothing out of the ordinary. Left work at the usual time and forgot the flippin' milk! I was in a right grump when I got home from work, no idea why! 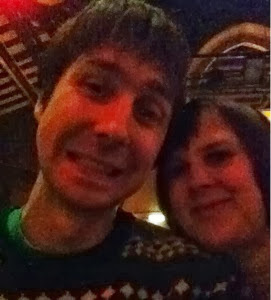 Mr Husband cheered me up with cuddles and loveliness. Sunday - My girls and I woke up at a reasonable hour, left Daddy to sleep and came down to have breakfast. We were in high spirits and having fun with one another. Then my Brother came in to complain that we hadn't locked the front door the previous night. Ugh! Front door locking is irrelevant to me, it's his job. He was awake when we came home. Why would I get involved, I don't really have any interest. Sometimes living so close to family is irritating in the extreme, and my brother, having learning difficulties, can be irrational, argumentative and downright bloody annoying! I think what gets me most is that if he gets upset, even if it's because he failed to do something properly, it's automatically my fault. Grrr. 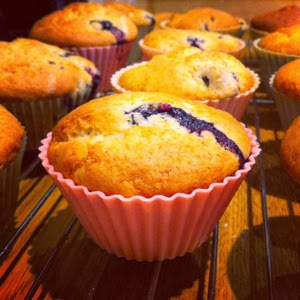 To de-stress I made blueberry muffins, before we had a quick lunch and went off for a little walk together. Geocaches were located, obvs. There's no glamour hunting for caches! Poor Biscuit was (very safely) dangled below a bridge! Don't worry, it wasn't over a river, just a twiggy ditch. 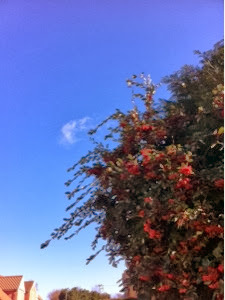 It was quite blustery, but I don't mind that. We walked past a lovely old house, hall I suppose, with a moat! I want a moat!! We came home and warmed up with a cuppa and watched Gnomeo and Juliet together - AMAZEBALLS! Then had yummy roast chicken before it was the kiddiwinks bath then bedtime. Mr Husband and I watched telly and snuggled in the evening. 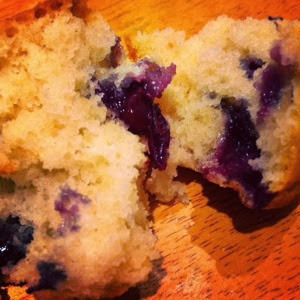 Who doesn't love a blueberry muffin? An official "superfood" wrapped up in a perfectly consumable cake! I whipped this recipe out this morning as we happened to have all the ingredients handy and some blueberries that needed a suitable home. One of the great things about this recipe is that you can actually substitute the blueberries for any berries you have around, even frozen are fine, just chuck 'em in, no need to even defrost! Prepare muffin tins, preheat oven to 385 - 400 degrees F, Gas Mark 5-6 or 190 - 200 degrees C.
Grab two bowls, into one place the flour, salt and baking powder. Into the other add the sugar, milk, oil and egg and mix. Add the ingredients of the wet bowl to the dry bowl and thoroughly, but gently, combine the two. It may be a little lumpy, that's fine, don't worry. At the last minute add the blueberries and gently stir through. Scoop the mixture gently into muffin cases in your muffin tray. Try and make sure you get an even distribution of fruit. Roughly 3/4 fill each case, big muffins are good! Place in the oven for 20 - 25 minutes, remove when golden brown and springy. According to my calculations, they work out at 119 calories per muffin (if you make 14). I used 5 ozs of sugar and whole milk (because that's what we had the most of) but if you're dieting I reckon you could lose some extra calories by switching/reducing. They come out beautifully soft, fluffy and, erm , muffiny. And they've got fruit in. Actual fruit. Scoff wildly and be happy! Have you entered my giveaway yet? If not, click the image below to be in with a chance of winning a selection of fabulous crochet gifts, good luck! Ahhh, the concentration! Both Biscuit and Wiggles making their own lunch. It seems to encourage them to eat nicely and they also enjoy being trusted to do a grown up job. I'm pretty sure Wiggles managed to feed the floor quite a number of blueberries, but still, the thought was there! It's Currently again! The delightful and charming Lindsey from Ot and Et is in charge whilst Randalin from Harvesting Kale is enjoying her time out. She's quite literally just had a little baby girl who needs all her attention right now. 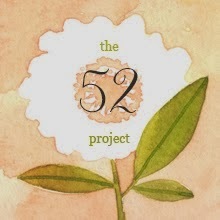 Co-hosting with Lindsey this week is Colleen from The Mommy Panda. Because of the complete and total loss of my camera, misplaced somewhere illogical, I've been happily snapping away on my phone. I like the freedom it gives me, but the picture quality is godawful. I need lose six pounds in the next week. This means I am stopping myself from consuming all manner of crap. No more cakes and biscuits and sweets and all that gubbins. I'm not entirely sure I can manage that much in that time frame, but there's definitely no chance if I don't cut out the crap. Wish me luck. I've been secretly spending money on four beautiful dresses that I found in a sale. I know four is quite a lot and pretty self indulgent, but they WERE IN THE SALE! Effectively I saved around £300. So I am good, right? Don't Mr Husband. I am planning on using "What, this old thing?" In a concerted effort to make less of a monument arse of myself on the tellybox I have been trying to swat up on some quiz questions. The only problem I have is that I find myself subconsciously skipping anything I don't know the answer to! I don't even know that I'm doing it. It appears that I am only capable of applying my brain when I already know what the answer should be. I wonder if they'll tailor the real quiz questions for me so that I wont want to skip those....? P.S Have you entered my giveaway yet? If not, click the image below to be in with a chance of winning a crochet blanket, handmade just for you and a selection of fabulous crochet gifts, good luck! You know that song, by Johnny Nash....you know...this one, yeah, that one! Well it refused to leave my head yesterday. Point blank refused. I know it's hideously British to carp on about the weather constantly, but yesterday morning Wiggles and I went for a walk together and ladies and gentlemen, after what feels like an eternity of never ending driving rain and impossible wind it was sunny. Actually sunny. In fact the sun shone on our faces as we walked and all but melted away the memory of it ever being any different. It was exactly what I needed. We went up hill and down dale and came back pink cheeked and cobweb free. It feels like so long since I've felt a little too warm in my coat, I've missed that. Wiggles was in her pram, jabbering away to herself about cats. 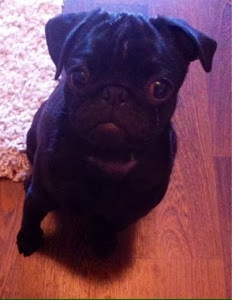 I hummed the above mentioned tune to myself in eternally optimistic fashion and Pearl the Pug trotted along beside us. I had one of those rare and beautiful moments when I just felt so thankful for the small, sometimes over looked things which surround us. It struck me that, yes, I could focus on the fact that one of the things I can see ahead of me is a dog's bum hole. 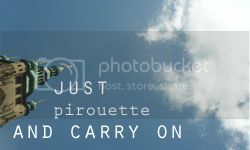 But I refuse! I choose to see sunshine. I choose to see a smiley kiddo and I choose to enjoy the fresh air and ignore the bum hole. I think that's a pretty good philosophy to have in life. Ignore the bum holes my lovelies and enjoy the sun! 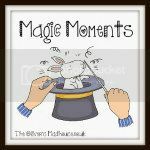 Happily linking up with Jaime and Magic Moments. Happy Monday one and all! The Week That Was - Wine, Wind and Whoah, there's a tree in your house! We're certainly smiling there, aren't we? You can almost hear the shouts of "Cheeeese!" Left to right that's Impressive E, Tilly and Lucky with me on the top. Wiggles and I did a little sitting and did some crochet whilst Wiggles "sorted" some wool. 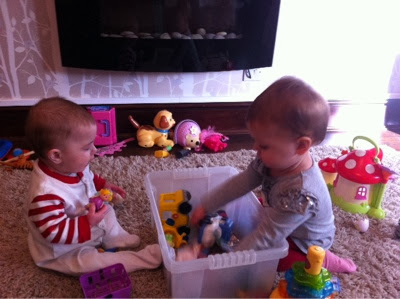 Poor Impressive E was feeling very poorly indeed, so we offered to have baby Beetle for the afternoon. Wiggles was wonderful with her! Fetching her toys to chew and giving her cuddles. Made me think what a lovely big sister she'd make. No, no, no more babies, sigh. 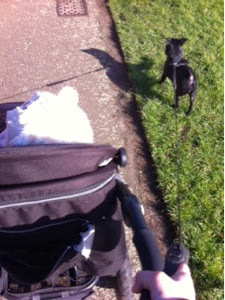 When it was time to do the school run I strapped Wiggles into her sling and pushed Beetle in her buggy. We picked up Biscuit and Woolly and came back for some pink milk and cookies to give Impressive E more time. She came to collect them around half past five. It was lovely to have them both and they were so good. 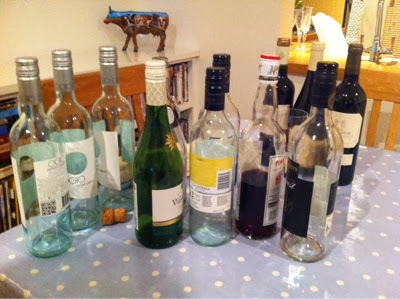 I felt quite smug that I'd survived looking after four small children on my tod! I went into work. Have I explained properly that on a Wednesday I work with my lovely friend LB? At half past two it has turned into something of a tradition for us to have a lovely cup of Earl Grey and a nice piece of cake or something equally decadent. Today we had the most marvellous choux buns provided by LB that were filled with creme anglaise. So delicious. As I was leaving work I had an email from the Eggheads team telling us all about filming dates and what to wear. When I got home Mr Husband was in a panic as they had brought the filming date forward by a day and we weren't sure if his work would give him the day off. It was tense. If he couldn't go the whole thing would be off, for all of us, eeeps! A small unknown quantity of Pimms. 24 spring rolls and some nuts! I was quite impressed! It certainly made me chuckle!! Thursday - Early phone call from Mr Husband to say that his work were wonderful and had agreed to let him off a day early. So relieved I can't tell you, I REALLY didn't want to have to explain that to my friends. Very, very thankful to his work for being so lovely. In the morning Wiggles and I shared a poached egg on toast (I didn't really want to share, but what can you do?) did a spot of washing and tidying, then popped round to Tilly's for a cuppa. Lucky and Dinky went too. Wiggles is so cute when she tries to say Dinky's name. 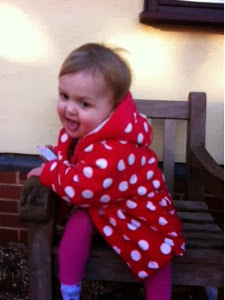 Even cuter trying to say Em's she pokes her tongue out when she does it, makes me laugh every time. A quick trip to the supermarket before making veggie bean chilli for everyone. In the evening we were supposed to go to WI for a Valentines cookery demonstration, but Mum was pooped so we chickened out. Friday - Work for me in the morning, running late so I was in a hurry. Biscuit had a Valentine's Disco after school and was so excited! I had a call just before lunch to say the school had rung Mum to report that Biscuit had a high temperature so she'd had to pick her up. She was gutted she'd miss her disco! I went out at lunchtime and bought her a Merida doll to cheer her up. I had an email at work to say Boden were having an 80% off sale. How could I resist? Four dresses later I felt pleased as punch. On the way home from work I collected Indian takeaway en route. It rained so hard I could barely see to drive. We were planning to watch The Hunger Games but it took so long to download onto our Sky box I have up and had an early night. I was le-pooped! Saturday - Poor Biscuit was still hot and a bit poorly. She ate some toast and needed to rest again so retreated to the sofa. 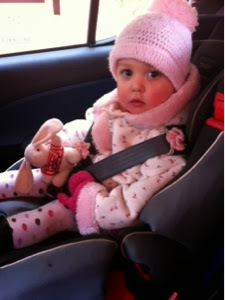 Wiggles and I drove Gran and Uncle to the station whilst Daddy looked after her. We popped quickly into the supermarket before heading home. 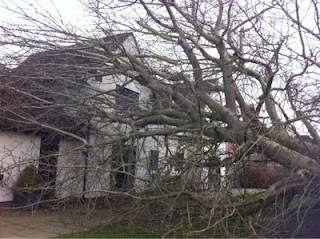 Once back we received a call from our neighbour to say a tree had blown down onto their house! Thankfully everyone was fine and it could have been a lot worse. They were very shaken up though, poor things! After leaving Wiggles and I collected newspapers for recycling from around the village. This is usually my brother's job, but he is away for the weekend. We came home, got changed and my MIL and FIL came for lunch. Biscuit went back to bed for a sleep and Wiggles had her nap so strangely it ended up just being the four of us! Mr Husband went out to buy Brave on DVD to go with Biscuit's Merida doll (which she loved) as she'd declared that she "didn't know enough about her". We all watched Brave whilst the wind blew outside. Biscuit cried. She is a terrible wimp. In the evening I went to a quiz night in the local village hall to raise funds for the Playgroup. I had a lovely time. We only came 5th out of 10, but hey! It was a lot of fun. Sunday - Despite it being my turn for a lay in I got up to feed the dogs early. Mum is away so it falls to me. Still, how can anyone resist this looking up at you? Mr Husband was going to the football for most of the day, so Wiggles and I grabbed the opportunity to get some fresh air whilst he and Biscuit stayed at home. We went for a lovely walk, it was bright and sunny and warm and we were even a little too hot a some points wrapped up in our heavy coats. When we got home Mr Husband set off for his day away and I began preparing soup for lunch. Wiggles ate it beautifully and Biscuit tried to join in, though in reality she just poked at it. Afterwards Wiggles had her nap and Biscuit and I made some crafty animal figures from the front of a children's magazine that her Nanna had given her the previous day. She did so well, she can be so precise when she wants to be! We spent the rest of the day doing very little and I got some time to myself in the evening to watch ladies telly and put my feet up. This I liked! A delayed post this week due to many things, not least of which is the fact that I have completed mislaid my camera. Not that this is too big an issue, I am in desperate need to a new one anyway, but an hanging out until my birthday in the hope that fortune might smile on me. So phone snaps I'm afraid it will have to be... this week, Wiggles legs it every time I come near her with a device that might capture her image. 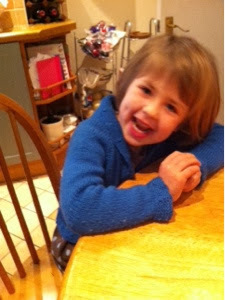 Instead I capture her cheeky little face, she knows just what she's doing. Biscuit spends the day on the sofa, serene, but poorly. Poor girl. She looks pale in this, and it makes me want to hug her. A lot. Is it my go? Is it my go? Yay!!! It's my turn to co-host this week's Currently again together with the gorgeous-ness on a stick that is Lindsey from Ot and Et. Exciting news this week! Randalin from Harvesting Kale has had her baby!! A little girl! We wish her all the best and send her so much love. Last week Colleen from The Mommy Panda was in cohoots and didn't she do a marvellous job, but like I say, yay! It's back to me again! Isn't shovelling a scandalously tricky one? I'm trying to decide on an angle I could approach this from...have I been shovelling food? Undoubtedly! But no, I want to think of something a little better than that... my approach to tidying up the Mini-Monkey's bedrooms is usually centred around shovelling; I go in with a big plastic box, pick up everything that's on the floor in a fashion not dissimilar to a shovel, and squeeze it away in a cupboard somewhere. Which then usually explodes onto Mr Husband at a later date - ha! I am ignoring Valentine's Day tomorrow. I may be a hideous old misery, but I hate it. I find it saccharine sweet and sentimental. I've always preferred to do nothing to celebrate, or to do something so understated it doesn't count. I think this year our plan is to sit together on the sofa and watch a film, which we do most Fridays anyway. I don't need a stuffed bear to show me I'm loved. I've been inhaling more than my fair share of damp morning air. Every day it seems to rain lately and every day I sniff it up. Especially when it does it sideways into my face. I've also been inhaling the delicious scent of my Mum's tea wafting through from the East Wing. Why does food someone else has cooked always smell so much better? Wiggles and I have a thing about hugging, I want a hug more often than she's willing to provide one. She knows this, she uses it to her advantage. I say "Can Mama have a hug?" She hugs the nearest toy and looks cheeky. I say "Not the toy! Mama!" She laughs like she's won. Cheeky imp. Thankfully Biscuit is always willing to give me some cuddles. Yay! After a boozey night out at the start of the week the hunt is on to discover who was throwing up! Somebody did a sick in Tilly's downstairs loo and did a drunk person's job of cleaning up. 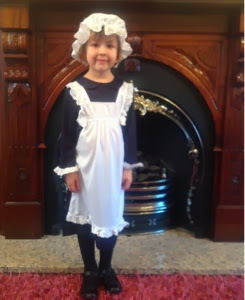 In that they did really well, but Tilly's house is cleaner than a operating theatre so she was alerted. The hunt is on to discover the mystery sicker-up. Nice choice of theme topic, right? It was Saturday night when it happened. It had been a bit of a dull day with nothing at all remarkable occurring. Because we'd been to the supermarket Mr Husband had bought doughnuts and had promised our tinkers that they could have one, as a treat, if they ate their teas nicely. Biscuit was taking HOURS as usual, but Wiggles had powered through, scoffing up her peas with a spoon and nomming down great shovelfuls of potato. She finished and I stood up to cut her a doughnut in half for her treat. Not entirely sure she would appreciate it, or even like it (I hate doughnuts) I asked her "Do you want some of this, darling?" And I showed her the sugary cake over her sisters head. And then she said it. Three words. Three. Little words. All in a row, nay, in a SENTENCE! Perfectly constructed, succinct and to the point. She bellowed back at me "Yesh peease Mama!" Her first unprompted sentence! And with a "please" in it! I was so proud I nearly gave her the whole doughnut. But I didn't. I just gave her lots and lots of kisses for being so clever. My little girl does sentences now, whooooo yeah! Magic that! Monday - Wiggles woke up screaming in a proper grumpy mood. That's not a good way for anyone to start the day. She howled and yowled and refused to eat her breakfast, I'm not sure what got her goat, but something definitely did! Biscuit went to school and I think she was glad to get away from all the noise. Wiggles and I spent the morning cleaning and tidying up after the weekend. We managed to clean a good few rooms before she had her nap. After which she refused to eat her lunch, I have no idea what made her so unhappy! After school I took Biscuit to her dancing class, which she loved, as always. Wiggles had to come to this week as Gran wasn't at home to babysit. She was, quite frankly, a pain the backside! But they can't all be good days I suppose! Tuesday - Wiggles woke up early shouting again and I feared the worst. Thankfully she seemed in a much better mood. We walked Biscuit to school and then in a change from our usual routine we went over to Zanne's, a new friend of mine's house. She lives in our village and has a little girl in Biscuit's class. She'd asked me to teach her how to crochet, and of course, I was happy to help. We happily spent the morning quaffing Earl Grey and learning some of the basic stitches. She was a natural and a pleasure to teach. I've taught quite a few people in my time and some, I have to admit, have had me pulling my hair out! We went home for lunch and Wiggles blew my socks off by heartily tucking into a whole boiled egg and a whole bunch of soldiers too! After her nap we drove round to the school to pick Biscuit up, I was a little dismayed to realise that I'd arrived silly early, and been able to just wander into the school (I hadn't realised the time). It really worries me that they aren't thinking about site security enough, but I'm just not the sort of person that barges into the Head's office and points out the obvious. I'm going to have to keep an eye on that I think! We drove straight from school into town to meet Tallulah for coffee. Biscuit decided that she wanted to order Babychino's for her and for her baby sister. It made me crease up to sit and watch the pair of them dunking their ginger biscuits into their milk and then glugging it all down. It was lovely to see Tallulah again and have a catch up, it felt like it had been ages. We walked round the shops and I bought the small ones a few treats for being such good girls. Wednesday - work, work, work, rain, rain, rain! Nothing of interest happened really. 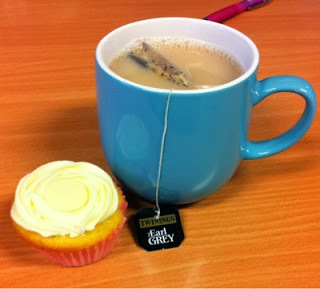 Although lovely Anne who I work with made us lovely little cupcakes to go with our tea. They were definitely a highlight! Thursday - Wiggles and I went to Biscuit's school assembly, Impressive E and Beetle came too. Biscuit didn't get upset at seeing us this time, which was a huge relief. Afterwards we walked the dogs with my Mum. Wiggles and I walked Pearl, Mum walked the other hound. It was nice, very windy, even Wiggles kept her hat on! Pearl does so well on her lead, although I swear she thinks she's a greyhound. Wiggles and I made Toad in the Hole for tea (she stirred) which spectacularly failed to rise! Both girls enjoyed chocolate mousse for their pudding, getting themselves utterly filthy! Friday - it has rained heavily overnight and when I tried to drive to work in the morning the road was entirely flooded. I had to turn around and use another route. Which in turn meant I was late. I felt a bit sod it so stooped off at a shop to buy some bananas and cereal for breakfast. I made a dull lunch hour a little more exciting my popping into Lush and buying my first ever solid shampoo bar. I went for "Seanik" following some guidance from the lovely shop assistant. I can't wait to try it, I've wanted to invest in one for ages, so I'm dead pleased. I had hoped to leave work early so that I could see the road a little better, but it was busy so it was quite late when I left, thankfully no problems. I brought Mr Husband his weekly curry from Ken home so all was well! Saturday - I honestly don't think I've encountered such a dull Saturday for a long time. Mr Husband wanted to watch football at lunch time which meant there wasn't time to go out in the morning, and not enough time in the afternoon to do anything exciting. The football went spectacularly badly so he wasn't very happy. We got cabin fever at around 4.30 pm and insisted in a trip to the supermarket. In the evening we watched amusing telly and I crocheted like a lunatic! Sunday - My lay in day, huzzah! The Seanik shampoo bar is amazing! Smells really fresh and makes my fair feel lovely and light. 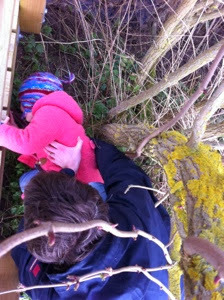 We went for a blowy walk in a local Country Park after lunch, found one Geocache then headed home. 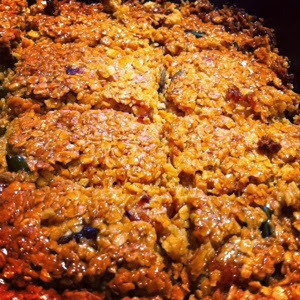 We made apricot and seed flapjack when we got home, because that's the sort of stodgy I like to scoff on cold days! The recipe can be found here if you would like it. In the evening Mr Husband went out with work friends to a quiz in the evening. I watched the Crime Channel and hid behind my blanket at scary bits!